Fixtures are announced tomorrow (2am MST) so figured I'd get the thread started to keep things tidy. 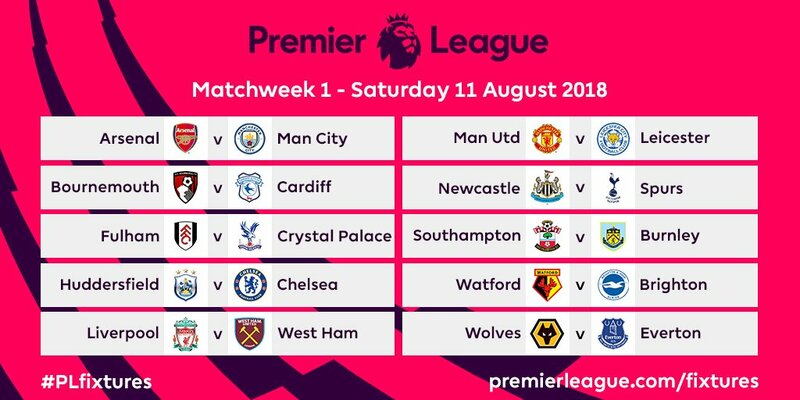 Hoping for Liverpool to get Man City at home on the first day while we have them on the back foot recently and hopefully get a hard win under our belt out of the way. Then asked the reason why, Laboley said: “There are many parameters, for now it’s premature to talk about it. [...] Manchester United wants to extend Anthony and does not want him to leave but we haven’t found agreement for several months. I think that when Manchester United, which is the most powerful club in the world, it must be remembered, does not find an agreement in eight months of negotiations, it is because they do really want to make him an important player. The agent explained that if it wasn’t for the support of Manchester United fans, Martial would have asked to leave the club already. I ####ing loathe Mourinho so much. He never learns - you'd think the fact De Bruyne, Salah and Lukaku are currently playing for three of Chelseas biggest rivals would be a bit of food for thought, but no. I'm sure Martial will rip it up wherever he goes while Mourinho will buy some 30-year-old "star" and turn him into ####. These were Mourinho cast-offs and KDB and Salah fought neck and neck for player of the year. Mourinho is one of those managers that only works with money. He can assemble established players and make them successful but he cant do much more than that. Hes going to end up like Wenger, someone who was an innovator until innovation passed him by and he couldnt keep up or adapt and hes trying to compensate for that with big purchases. Can't imagine anything less than a league title or CL title will be good enough for Mourinho. He's already lost a lot of fans with the revolting style of play, but you'll take that trash if it means winning. Selling possibly the most popular player? Yeesh. I would imagine Martial for Willian+ is a very likely ending to this. Martial has been linked with Spurs fairly regularly, and I really hope that happens. Apparently though, neither Rose nor Alderweireld are been sought by United anymore, so that might make it less likely. At this point the only player I would like to sign more is Ramos. Good luck! Then if you could manage to sign Fellaini you could have the elbows flying all the way from the defence on forward. well I still get excited because I feel the next manager will then have a solid base to work with. Mourinho will be gone sooner or later, and the next manager will surely find the Freds and Dalots of this summer window useful too. So I'm still excited about signings that make sense. BBC and Sky say that United have no intention of selling Martial and that he's part of the long-term plan, so that's good. I hope the club put their feet down and don't let Mourinho make the call. I'm looking at going to Chelsea and Arsenal games while I am there in September. It's been a minute since I went to a PL game (2011). Any recommendations on purchasing single game tickets, 2 per game? was to be somewhat expected with Alisson being Madrid bound, but still ... absolutely amazing news if true. David de Gea has agreed a new five-year deal with Manchester United. Did you guys know there is a rule that the top 6 can't play each other on the first or last day? I read that the other day for the first time. Thoughts and prayers to Arsenal finishing in 7th or below this year! Hopefully they have to hire Big Sam halfway through the season to attempt a great escape! I would love to see Big Sam coach Arsenal. That would be a dream. Emery is getting two years, Kroenke is way too cheap to fire him. Oh probably, but then if things are disastrous around Christmas (and here's hoping! ), you have to do something. I think Arsenal placing mid-table and even lower, is being overblown. Their fans have wanted a new manager, and with that a reset -- further down the table is to be expected.